Our advanced manufacturing unit is instrumental in manufacturing a wide range of Squeeze Connector. 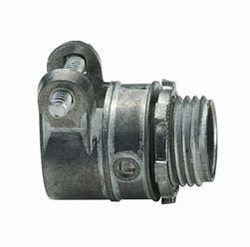 These connectors are useful in offering smooth electrical connection and are thus used in various electrical purposes. We manufacture these connectors using high quality raw material, which offers them durability and makes them resistance to corrosion. We offer Straight Squeeze Connector with zinc alloy die casting and insulated throat, which provides concrete-tight connections.